Cassell EJ. 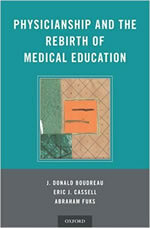 Physicianship and the Rebirth of Medical Education. 1st ed. Oxford, UK: Oxford University Press; 2018. Cassell EJ. 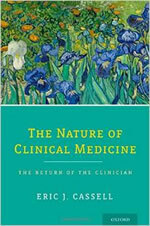 The Nature of Clinical Medicine. 1st ed. Oxford, UK: Oxford University Press; 2014. Cassell EJ. The Nature of Suffering. 2nd ed [revised with 3 new chapters]. Oxford, UK: Oxford University Press; 2003. Cassell EJ. Doctoring: The Nature of Primary Care Medicine. Oxford, UK: Oxford University Press/Milbank Memorial Fund; 1997. Cassell EJ. The Nature of Suffering. Oxford, UK: Oxford University Press; 1991. Cassell EJ. Talking With Patients: Clinical Technique, Vol II. Cambridge, Mass: MIT Press; 1985. Cassell EJ. Talking With Patients: The Theory of Doctor‑Patient Communication, Vol I. Cambridge, Mass: MIT Press; 1985. Cassell EJ, Siegler M, eds. Changing Values in Medicine. Frederick, Md: University Publications of America; 1985. Cassell EJ. The Place of the Humanities in Medicine. New York, NY: The Hastings Center Publications; 1984. Cassell EJ.The Nature of Healing: The Modern Practice of Medicine. Oxford, US: Oxford University Press; 2013.